If you follow along my blog you will know that we eat rotisserie chickens about once a week (Costco is our favorite - Walmart comes in second). Well, they taste delicious but who knows what they put in those things to make them taste so good. Lots of salt for one. I figure I better learn how to roast a chicken and at least try and roast my own once in a while. I'm not crazy about handling raw chicken and carving is just an extra step when dinner is ready. So I ordered some chicken pieces from Harvest Moon. They are organic/antibiotic free chickens. They don't use growth hormone in Canada for chicken or pork (just beef) so that isn't an issue. I got one chicken - which is about 9 pieces of chicken in a 5 lb bag. Plus they gave the extra parts that I used to make soup base. They were not cheap but I think its worth throwing into the rotation here and there to get away from the antibiotics. We eat a fair amount of chicken - like I'm sure most of you do. Will I keep buying rotisserie chickens. Yep. Will I make this once a month. Yep. Was it easy and tasty. Yep. Mix all these spices together. Drizzle the chicken pieces with olive oil. Rub one batch of Mama's 9 spice rub all over the chicken pieces to coat evenly (and under skin where possible). Put in the fridge overnight or for a couple of hours to "marinate". Put chicken pieces in one layer in a roaster with the skin side facing up. Cover tightly with aluminum foil and then the lid. DO NOT add any water, stock or other liquid. Bake for approximately 2 hours until it reaches an internal temperature of 180. Don't peak until its ready. 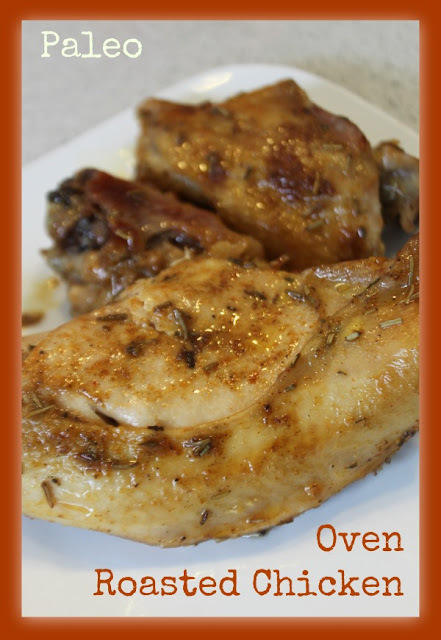 Baste the chicken with pan drippings before serving. Enjoy. Now that was easy.